I love Porh Roëd beach : nestled between the villages of Kermarec and Locmaria, it is only accessible by a small path. Its size is perfect, not too big so you never have to walk long ways to go swim and not too small to never feel crowded (hmmm, then again, the beaches of Groix are never crowded 😉 ). Sitting on the beach, facing the water, the « Pointe des Saisies » is on the left hand side, separating Porh Roëd from the entrance of the Locmaria harbor. Its rocks form little ponds from where to gather shellfish. Children love them – their own private pools ! Thanks to les Saisies, the beach is very often protected from the wind, perfect if you’d rather swim in a calm sea. The sand is a little less refined as on some other beaches, but it’s nevertheless nice, mixed with seashells. If you’re looking for shade, you can find a spot by the rocks. 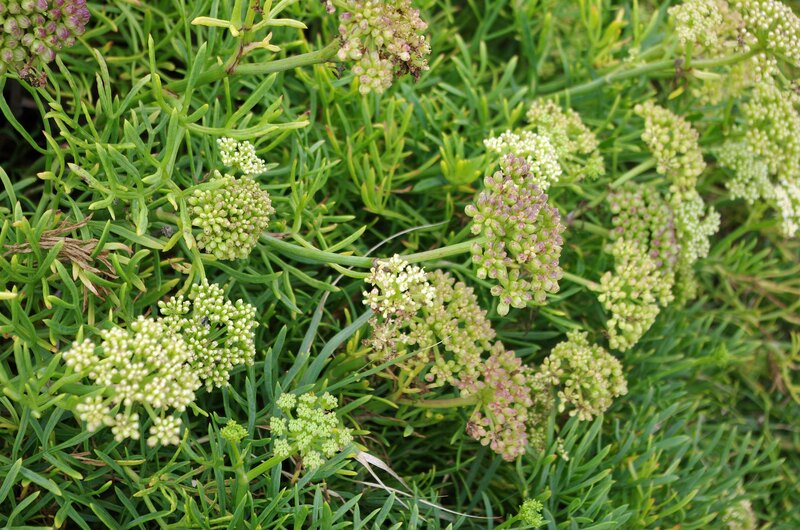 Don’t miss the samphire or sea fennel : those succulent-looking green plants that grow right in the rocks, among the lichen, or even in the sand. Grab a small leave and smell it : this salty perfume brings back many childhood memories of playing at the beach with my sisters. This plant is sometimes used a seasoning for fish and seafood dishes. After a nice afternoon on Porh Roëd’s beach, leaving the beach towards les Saisies will take you to the picturesque harbor, beach and village of Locmaria. On the way there, you will spot many beautiful creeks : so small they’re perfect for one family ! Great places to feel like a Robinson Crusoë !